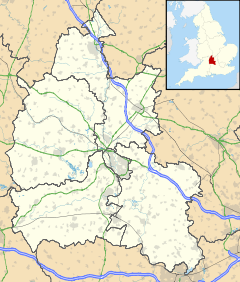 Charlton-on-Otmoor is a village and civil parish about 4 miles (6.4 km) south of Bicester in Oxfordshire, England. The village is near the River Ray on the northern edge of Otmoor. The 2011 Census recorded the parish's population as 449. Charlton had a parish church by the 11th century. The present Church of England parish church of Saint Mary the Virgin was a 13th-century Early English Gothic building but received substantial Decorated Gothic alterations in the 14th century. The east window is slightly later, in the transitional style from Decorated to Perpendicular Gothic. Around the beginning of the 16th century the clerestory and new roof were added to the nave and a new window was added to the south aisle. In the early 16th century the present rood screen and rood loft (for a crucifix between the chancel and nave) were added to the church. During the English Reformation Edward VI's injunctions of 1547 instructed that rood screens and lofts be removed from all churches in England and Wales. Charlton's screen and loft survived these injunctions, and in the 20th century the critic Jennifer Sherwood judged them "the finest and most complete in the county". A tradition of garlanding the rood cross with flowers and box greenery on May Day and carrying it in procession around the parish also survived the Reformation and continues in modern times. In recent years due to pressure on the school administration it is usually impossible to hold the May Garland Service on May Day so it has to be held either in late April or later in May. In 1846 the Gothic Revival architect G.E. Street re-roofed the church and restored the north wall. In 1889 the rood screen and loft were restored. St Mary's has never been over-restored, and its Decorated and Perpendicular mediaeval character has survived almost intact. By 1553 the bell tower had five bells plus a Sanctus bell, but all have since been recast or replaced. Richard Keene, whose foundries included one at Woodstock, cast the two largest bells in 1681. Thomas Lester of the Whitechapel Bell Foundry cast another bell in 1746 and Matthew II Bagley of Chacombe, Northamptonshire cast another in 1755. The then treble bell broke in 1789 but John Warner and Sons of the Whitechapel Bell Foundry recast it that same year. In the 19th century the Bagley bell survived for a long time with a fracture, but in 1895 its tongue and head fell out. Mears and Stainbank of the Whitechapel Bell Foundry replaced or recast the broken bell in 1898. In 1998 the Whitechapel Bell Foundry cast a new treble bell, making the 1789 bell the second bell and increasing the tower to a ring of six bells. In 1999 the new bell was hung and the old bells re-hung as a project for the village to celebrate the Millennium. John Warner and Sons cast the present Sanctus bell in 1793. St Mary's church clock is of unknown date but appears to be late 17th century. Two of the wheels of the going train are characteristic of the work of the clockmaker and bellfounder Edward Hemins of Bicester, which would make them an early-18th-century alteration. St Mary's is now part of the Church of England Benefice of the Ray Valley. Charlton had a Baptist meeting house by 1810 and a new Baptist chapel in 1835. The village had a Methodist congregation by 1829 which built a new chapel in 1840. The Methodist chapel had ceased to be used by the end of the 19th century and was sold to the Church of England rector in 1920 who converted it into a club room. Charlton has one public house, The Crown. There was formerly another pub, the George and Dragon, a 17th-century house at the eastern end of the village. This was where locals formed the Otmoor Association in 1830, leading to the Otmoor Riots in opposition to plans to drain and enclose Otmoor. The rioters achieved their objective, and the villagers continued to farm a four-field open field system. A subsequent attempt at enclosure in 1858 was successful. The enclosure of 1858 set aside land for the building of Charlton Parochial School, which opened in 1866. The number of pupils grew and a second classroom was added in 1892. It was reorganised as a junior school in 1937 and became a voluntary controlled school in 1951. It is now Charlton-on-Otmoor Church of England Primary School. Otmoor Women's Institute meets in Charlton-on-Otmoor. Charlton United FC plays in Oxfordshire Senior Football League Division One. The nearest railway station is Islip, 2 1⁄2 miles (4 km) from Charlton. It is served by Chiltern Railways trains to London Marylebone via High Wycombe and to Oxford via Oxford Parkway. The Buckinghamshire Railway between Bletchley and Oxford passes through Charlton parish and was completed in 1851. The London and North Western Railway took it over in 1879 and opened Charlton Halt, 1 mile (1.6 km) north of the village, in 1905. The 1923 Grouping made the L&NWR part of the new London, Midland and Scottish Railway, which closed Charlton Halt in 1926. The LMS was nationalised as part of British Railways in 1948, which ended passenger services in 1967 and reduced the line to single track. Oxfordshire County Council got BR to reopen the line in 1987 and Islip station in 1988. From 2014 to 2016 Network Rail rebuilt the railway as an 100 mph (160 km/h) main line linked to the Chiltern Main Line by a junction at Bicester. "Tchure" is a common Midlands dialect word for an alley. The Tchure in Charlton-on-Otmoor is an old alleyway that is now a bridleway. Oxfordshire has identically named alleys in Deddington and Upper Heyford. ^ "Area: Charlton-on-Otmoor (Parish): Key Figures for 2011 Census: Key Statistics". Neighbourhood Statistics. Office for National Statistics. Retrieved 10 November 2015. ^ a b c d e f g Lobel 1959, pp. 80–92. ^ Sherwood & Pevsner 1974, pp. 529–530. ^ Sherwood & Pevsner 1974, p. 530. ^ a b c d "Charlton-on-Otmoor". Oxford Diocesan Guild of Church Bell Ringers, Bicester Branch. Archived from the original on 13 August 2011. Retrieved 9 September 2011. ^ a b Baldwin, Sid (7 September 2011). "Bell Founders". Dove's Guide for Church Bell Ringers. Central Council of Church Bell Ringers. Retrieved 9 September 2011. ^ a b c d e f Baldwin, John (10 March 2005). "Charlton on Otmoor S Mary V". Dove's Guide for Church Bell Ringers. Central Council of Church Bell Ringers. Retrieved 9 September 2011. ^ a b Beeson & Simcock 1989, pp. 33–34. ^ Archbishops' Council (2010). "Benefice of the Ray Valley". A Church Near You. Church of England. Retrieved 9 September 2011. ^ "94 - Oxford - Islip - Ambrosden". Bus Times. Archived from the original on 22 March 2019. Retrieved 22 March 2019. ^ "CHARLTON - ON - OTMOOR SERVICES LTD". Vehicle Operator Licensing. Archived from the original on 22 March 2019. Retrieved 22 March 2019. ^ Crossley 1983, pp. 81–120. Beeson, CFC; Simcock, AV (1989) . Clockmaking in Oxfordshire 1400–1850 (3rd ed.). Oxford: Museum of the History of Science. pp. 33–34. ISBN 0-903364-06-9. Jackson, Christine (2008). "Thomas Garth, Rector of Charlton-on-Otmoor, 1615–1643: Rake or Reformer?" (PDF). Oxoniensia. Oxfordshire Architectural and Historical Society. LXXIII: 45–58. ISSN 0308-5562. Lobel, Mary D, ed. (1959). A History of the County of Oxford. Victoria County History. 6: Ploughley Hundred. London: Oxford University Press for the Institute of Historical Research. pp. 80–92. Sherwood, Jennifer; Pevsner, Nikolaus (1974). Oxfordshire. The Buildings of England. Harmondsworth: Penguin Books. pp. 529–530. ISBN 0-14-071045-0. Wikimedia Commons has media related to Charlton-on-Otmoor. Charlton-on-Otmoor page from Otmoor Noticeboard website. This page was last edited on 22 March 2019, at 16:50 (UTC).